Nearly three months on, my flowering annuals are (mostly) still alive. I feel like it's been this month, July, which has taught me the most so far about caring for the plants, as well as what I really want from this kind of gardening. July started off with a bang, literally. The monsoon came in like clockwork on July 1, which is the norm here (it might not start on July 1 every year, but it does usually start up sometime in early July). With near-daily thunderstorms, I was able to skip waterings here and there. The soil was often saturated in the mornings and I didn't want to overwater. I think the flowers were at their peak of attractiveness during this time. The lobelia was still holding its own and the verbena was just starting to trail a bit. The petunias were giving me trouble again, though. I was finding more and more caterpillars on them. I ended up buying a spray at Lowe's, Garden Safe pest repellant spray for organic gardening. I really doused the whole planter with it but the effects only lasted a couple of days. For the price of the spray, it seemed like a waste of time and money, but I continued using it a few times a week. I felt it couldn't hurt and I did eventually see a few new petunia blooms. Lots of rain over the past two weeks. I think the plants grew a lot and it has been nice not to have to water every morning. The geraniums and verbenas continue to be the most prolific plants in the bunch and I think they're looking very lush and colorful. The lobelia is getting crowded, I think. And the petunias are doing okay, but not great. They are flowering again, albeit with smaller, crumpled-looking flowers. I'm still picking the caterpillars off when I see them, but they are slightly diminished. I've been trying to figure out what kind they are; I'm seeing lots of swallowtail butterflies in our mimosa tree and I think they might be swallowtail larvae. If so, they make a beautiful butterfly but they're a real nuisance as caterpillars. Maybe I'm seeing fewer of them as they progress through the life cycle, though, which is a good thing. I hadn't used any Miracle Gro since the monsoon started but I gave them a dose this week. I was noticing that some of the geranium flower heads were looking sparse and spindly, and thought they could use a feeding. I was using it every two weeks but I've slowed down lately, between the rainfall and the fact that I've been putting the pest spray on lately; I don't want to overwhelm the plants with chemicals. I lost a petunia plant altogether this week. There was one at the left-hand side of the planter as you face it. One morning I came out to find that it was brown and sickly-looking. There were a couple of caterpillars on it, but I can't say whether that was related. Those caterpillars rile me up. I'm not happy about them. Thankfully, I'm seeing fewer all the time. The lobelia is looking really choked. I will have to see if I can find a more trailing-type of lobelia, which might be able to climb out from under the other plants more easily. Otherwise, the verbena and geraniums continue to grow like weeds, threatening to engulf everything else. I really like the look of all the red and pink flowers together; I often peer out at the planter from the sliding door off the breakfast nook and think how happy it makes me to have colorful annuals in my own yard, finally! Well, the lobelia is all but swallowed alive by the verbenas. It was nice knowing you and your pretty blue flowers, lobelia. The whole planter is looking a little wild to me these days. I keep dead-heading and clipping off spent flowers as I see them, but I think maybe the planter has been getting a little too wet. Last week was dry and I ended up needing to water most mornings. But maybe the soil was still wet underneath and I just didn't realize it. Either way, the rain is back this week and I've been holding off on watering again, since a little has fallen every day and the forecast seems to be the same for the foreseeable future. I'll wait until I think they need more water. I'm still enjoying the colors very much, even though things are looking a little scrappier now. One thing I've learned is that verbena and geraniums grow like crazy, while petunias get eaten and lobelia kind of disappears in the jungle of other plants. I think that I will avoid petunias and lobelia in this planter in the future. If this year is any indication, I should be able to cultivate quite a lush assortment of geraniums and verbenas all by themselves in the future. The monsoon will continue, and August is technically our wettest month here, so the watering may continue to be infrequent. But I will take it day to day, of course. I will probably give another Miracle Gro feeding soon, but may hold off on the pest-repellant, since the petunias have seemed better in late July. I will need to start thinking about what I want to do with the geraniums. I know they can be saved indoors over the winter, but I need to read about that. August will continue to be warm and summery, but by the middle of September the nights will be cool so I'll need to think ahead for that too. I'm fine with losing annuals after a growing season, in any case. I've enjoyed having these but they're cheap to replace and this was sort of experimental anyway. How are your annuals doing this month, if you plant them? All day long, we strolled along the famed Fisherman's Wharf. We stopped to look at almost everything. It was breezy but warm, the sun shining brightly in a clear blue sky. Sea birds flew overhead and roosted on railings and fence posts. Some scrabbled for food scraps on the piers. All were bold, unperturbed by the tourists, joggers and cyclists crowding the piers and walking paths. We headed north along the Wharf, the San Francisco Bay to the right of us, busy city streets to the left. As the day wore on, and the breezes picked up, the bay teemed with boats of every kind: sailboats, speedboats, passenger boats for tourists and far off in the distance, container ships arriving from far-flung places. Every few piers, there was another mooring for sailboats and I stopped to view them with interest. Sailing must be a big deal here; San Francisco hosted the America's Cup competition in 2013. It must be said that I am not a sailor. I grew up within a mile or two of the mighty Hudson River, but we were not a boating sort of family. I did have a ride on the sloop Clearwater when I was in elementary school; this is a sort of research vessel which travels on the river, offering marine education and raising environmental awareness. I remember very fondly the day my class spent on the Clearwater, which was manned by hippie college students and a few older professorial types: scruffy beards, tie-dye, bandanas. I enjoyed seeing the below-deck spaces, especially; the idea of sleeping in a boat was exciting to me. The views from the upper deck were spectacular; it was thrilling to watch the familiar landscape slide past as we moved down the river. Twenty-five years on, I remember oatmeal-raisin granola bars, "orange drink," springtime foliage, brownish water, bright-blue sky, white sails with a yellow and orange sunshine-like emblem. On the Wharf, the boats just kept coming. By afternoon, they were out in force. The sky was not as clear in the afternoon, and a haze was developing far out on the bay. But boats were everywhere, close to shore and farther out, all the way out to the place where water blended with hills and sky in blurred layers of grayish-blue. People were enjoying their beautiful bay. We stopped in a park at the northern tip of the Wharf, exhausted from walking all day in the sun and the stiff, salty breeze. I had a light sunburn on my face. My legs and feet hurt. We lay in cool, green grass and listened to conversations in several different languages. We watched couples of all ages lounging and laughing in the sun. We watched sailboats move toward the vast orange expanse of the Golden Gate Bridge. It was late enough in the afternoon that we were beginning to think about dinner. We walked back down the Wharf, in search of New England-style clam chowder in sourdough bread bowls. You can get them almost anywhere on the Wharf but we wanted to eat at Alioto's, where we'd eaten almost ten years before, on our first trip to San Francisco together. We ate in a big, sunny window, overlooking sailboat docks. The boats rocked gently in gray water as the sun began to sink in the sky. The boats here were older; some seemed disused, I thought. They had names like Thor and Lucy. Some had fake-grass carpeting on their decks, worn and tattered. There was rust. It was not the pretty view of boats on other parts of the Wharf. It was interesting dinner viewing all the same. I don't usually get to eat a few feet from sailboats. After dinner, we boarded a passenger boat to Alcatraz Island, to tour the old prison there (now a National Park and historic site). The sun was setting. The wind was calmer, the bay stiller than it had been in the afternoon. Water and sky were more defined now, the sky fading in progressive shades of blue, lavender and pink, the water deepening to turquoise and cobalt. I think a sunset sail must be wonderful. It was chilly on our passenger boat, though. We sat on the open deck so we could see the bay. I was shivering in my sweatshirt. The passengers on our boat were mostly couples. There was lots of hand-holding and hugging to keep warm. We eventually did some of that too, once we both put our cameras down. I think this might be the most romantic city I've ever visited. In fact, my husband might not be here if it weren't for San Francisco. His parents, graduate students across the bay at the time, had their first date here close to fifty years ago, in a fancy seafood restaurant on the Wharf. Our romance has connections here too. The last time we visited was a year to the day before I found myself seriously ill, struggling to survive the birth of our son. 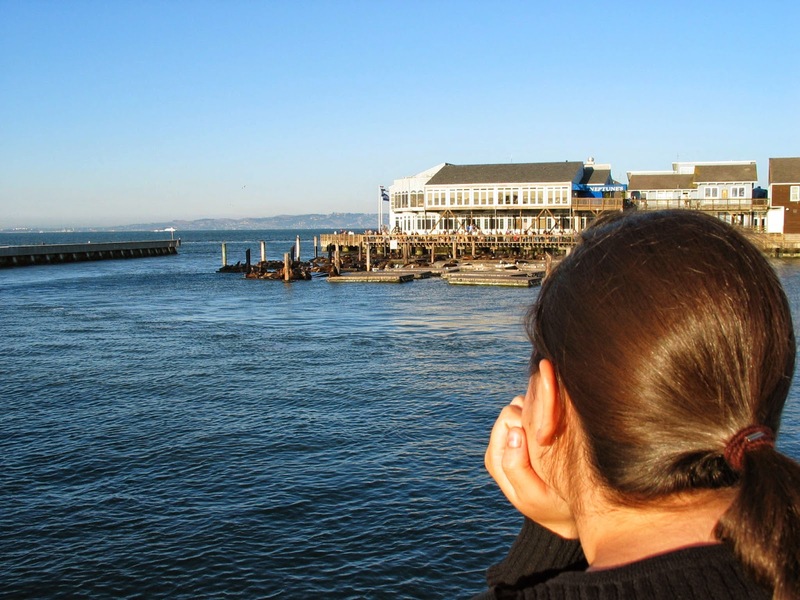 That's me above, in 2004, watching the boats and the hordes of seals basking on a pier in waning September sunshine. That first visit was short - a stopover, really - and I had always wanted to go back. I'm so glad we did. I watched the seals again, the few that were present in June, the many kinds of boats and the subtle, smeary demarcations between sky and land and water. I felt stronger and wiser this time, thankful for my happy marriage, my delightful children and my health, and the chance to see the bay again. As the evening wore on, the sailboats dwindled in number but there were still a few out there, white sails billowing gently, right up until it got dark. The setting sun danced on the water and the sky faded gray to black, stars appearing through the haze. Our Alcatraz tour was fascinating, but I looked forward to the return trip, when I would see the bay at night. We collapsed into our seats on the boat, tired but satisfied, full with the experiences of the day. Night fell and lights sparkled all along the bay. Bridges, twinkling as if strung with fairy lights, stretched as far as I could see. We walked a long way again, this time back to our rented car. We held hands and laughed, giddy with the thrill of a rare nighttime outing, just the two of us, chilled and windblown and tired to the bone. I started working on my flowery circles almost six months ago and finished them this week. There are 192 in total, too many to photograph without help from the Bear and his monopod. I'll have him help me take some good overhead shots of the finished blanket. For now, I think these photos give a good idea of the color palette and the general tone. I'm using Solstrikke's Flowers in the Snow pattern for both the circles themselves and her joining method, which creates a really beautiful, lacy effect between the circles. Solveig's tutorial is really good and I'm impressed that she provides an English version in addition to the original Norwegian one. I recommend her pattern highly. 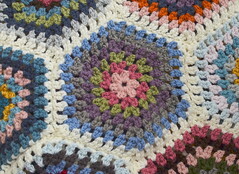 I had my eye on this blanket for a couple of years before I started making my own. I had seen it on Ravelry and fell in love with it. It seemed much too complicated for me and I held off trying it out until this winter, when I finally felt like I could tackle it. 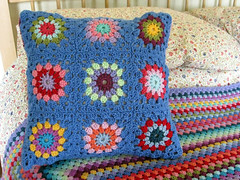 I'd made flowery circles before, when I made my cushion cover last spring, and I'd enjoyed working on them. I was a little wary about all the weaving-in I'd have to do for a blanket made from them, though. This blanket is for my GB. I'd never crocheted a blanket expressly for her before. But I wanted it to be special when I did, and I think this one should fill that bill nicely. It's a grown-up blanket, fancy and intricate. Every circle is different. I stored my circles in these two shoeboxes as I finished them. I had mentioned this in a previous post about this blanket; I really liked having them in the shoeboxes because it made it easy to see the colors of the outer rounds as I worked. Then I could make more with a given color if needed. Plus it kept them all contained; I had previously stored granny squares in shopping bags on the floor around my desk. This was messy and disorganized, and people were kicking my bags and stepping all over the squares. Not so this time; I kept the boxes on the top shelf of the bookcase next to my desk and they were safe and tidy up there. I have limited space for crafting but I'm getting the hang of keeping my supplies organized and accessible. The circles will be randomly placed in the blanket, for the most part, but I did try to keep the colors spread out a bit. I didn't want too much of one color to sort of pool in a small area of the blanket. I laid them all out on the floor and moved them around accordingly. The blanket is made up of 192 squares, arranged 12 by 16. To keep them in order the way I wanted them, I picked up each row of 12 and threaded a piece of yarn through the centers of the circles, tying it in a bow. Then I put a numbered Post-It note on each bundle, folding the note to make a tag. I put all the bundles back into the shoeboxes in numerical order. This might seem obsessive, but it helps me keep some order. Hey, I gotta be me. I've only just started joining them. I really like Solveig's join-as-you-go method. I had very little prior experience with JAYG, but I like it a lot. I have had some trouble with joining squares before; the crochet- and sew-together methods I've tried left the finished pieces rather lumpy and stiff. I like this joining method because it looks light and open, and the joins are lying nice and flat. I actually did some frogging when I first began the joining process. The yarn I had initially opted to use, Lion Brand Baby Soft in White, didn't work well. It was too thin, light and fluffy. It was looking sort of raggedy to me. The circles are made mostly from Stylecraft Special DK, which is quite a bit stiffer and sturdier than this other yarn. I decided not to use it. I frogged the few joins I'd done and started over with Stylecraft in White. I had three balls, which is about half the total I'll need. I ordered some more from Wool Warehouse and it should be here soon. (I'm still wishing we could buy this yarn more easily in the US. It makes a wonderful blanket). I'm really enjoying this blanket. I did the bulk of the work over the past couple of months, making more than half the circles in that time. But I've got nearly six months' work into it all together now and it has been a pleasure to make. I look forward to giving it to my little girl. I've even been thinking that I might gift it to her sooner than I'd planned; the joining is going so quickly now that I may give it to her for her birthday in early fall instead of Christmas, as I'd been thinking before. Then she can use it sooner too, as the weather begins to cool down. I plan to keep it on her bed, folded at the foot and pulled up at night as necessary. I'm in no hurry, though; I like seeing this blanket come together. I've learned to savor my projects more lately. The really fiddly part of this project - the tri-colored circles - is past now. The joining is rhythmic and rather soothing, I think. I have loved working on it when my GB is around because she watches carefully and makes lots of observations. She has always made me want to heap pretty things on her. It's one of my favorite things about my daughter; she's like a muse to me. She motivates me to learn and create. I'm feeling a lot better these past few days. I was in a funk for a little while, feeling bored, anxious, restless, kind of weepy. Then I spent time with some new babies and that really put me over the edge. My life actually depends on never doing that again, but my heart doesn't care. I felt weird physically too; I had the most aggravated, itchy kind of feeling, like my skin was too tight. Nothing was going particularly well. Even blogging felt wrong. Blogging is strange when I don't feel like myself; I like to be authentic, but not a downer. I'm sorry if I was. Thanks for bearing with me. The stars aligned and life perked up. I spent time with a friend. I painted my nails. I heard news of a remarkable second-chance romantic relationship. I spent a restorative Sunday afternoon puttering alone in the kitchen, roasting a chicken and winging a peach cobbler. It worked. I wrote it down to try again another time. I'm feeling better about summer vacation. Kids get bored too. They don't mean to distract me, they just love my undivided attention. I'm lucky to be able to give it to them freely. 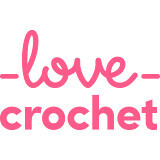 I have been crocheting every day, while we listen to our audiobooks, and guess what! My flowery circles are done. Yep, I've made all 192 of them. I finished them yesterday. In early June, once I'd made half the circles, I decided to make four of them each day. That made it all seem very manageable...and now for the joining. I've also been enjoying evenings in the backyard with the Bear after the children have gone to bed. We do it often, weather-permitting. The sun is setting, there is often a nice breeze and it's not too hot. We sit on the patio and talk, usually letting the hens free-range around the yard. We pick them up for a cuddle, but mostly they just waddle around, eating apples and leaves, chatting and squawking. I think they get a little overwhelmed by the small Bears when we let them out during the day, so it's nice to see them exploring in a more relaxed way in the evenings. It cracks me up to see them standing on the lowered end of the see-saw, or standing atop a riding toy. I also like to do a little pruning and plant-inspection in the evenings; it's cooler and I can concentrate on the task a little better. The Bear made me a little shepherd's crook for the back planter bed. I had a garden decoration with copper bells and glass beads that I wanted to display but couldn't find the right kind of stake to put in the ground. We were at Lowe's recently and he suggested buying a thin metal rod that he could bend for me. He painted it with black spray paint left over from the gate we painted this spring. It cost about $2 to make and it's exactly what I wanted. I'm so proud of him. He can do basically anything. I admire my new crook ten times a day. I often discuss my own crafting and how it makes our house a home, but he makes things too, and his making is just as important to our home life as mine is. Place peach slices in greased 8-inch baking dish. In a bowl, combine remaining ingredients to make a thick batter. Pour or spoon over peach slices, spread with a spoon or offset spatula to cover fruit. Sprinkle batter with about two tablespoons sugar. Bake at 400 degrees F for about 40 minutes until topping is brown. Serve warm.